The weekend just felt like a holiday for some reason. It was totally relaxing, but full of activity. On Saturday R and I went in to Ipswich to do shopping. This isn't something that you could normally call realxing, but for once we got everything we were looking for and also avoided all of the rain showers too. We used the Park and Ride in to town for the first time ever. It was nice to have a change and avoiding queuing traffic in to town, plus the overpriced car parks. £3.00 for up to 5 people to get the bus in and out. On Sunday we got our bikes out of the garage for the first time in over a year and headed over to R's parents. We all went out on a 21 mile route using the lanes and bridleways around Rendlesham. On one part we came across a field dotted with some wild flowers we haven't seen before and haven't yet identified. On the way we found one geocache that we had looked for a few weeks ago but hadn't been able to find. Going back a second time, we discovered it within a few minutes. The pot was small, and well camouflaged, but we were sure we had checked there before. Even this time I overlooked it once. 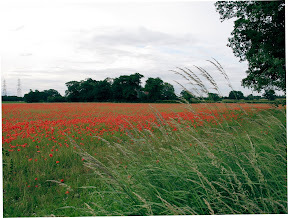 Further on was a field completely filled with poppies. 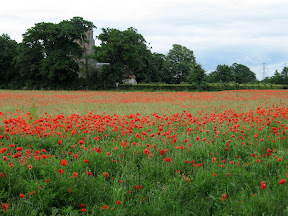 Quite often in Suffolk the crop fields have quite a lot of poppies in them, but this was the fullest field I have ever seen. A farmer who used to own the field stopped and told us that this was the finest display he had ever known in 40 years. Apparently the field used to be regularly sprayed when sugar beet was grown there so they never came up. Then Jordans cereals wanted oats grown there, and the use of chemicals was restricted so the seed started to grow. Now the field has been set aside for a few years and this is the result. The photo's really don't capture the full effect. The church is Blaxhall, so stop by if you are in the area soon. After our exercise we rewarded ourselves with an Indian meal at The Bengal in Wickham Market. Monday morning started out a bit wet so we were'nt sure what to do. We met up with R's old schoolfriend who was back in Suffolk for a few days and went to complete another geocache at Hemley. This involved looking round the church there to get information to put coordinates together where the actual cache container was hidden. This turned into a great walk along the River Deben. Next stop was Newbourne Springs nature reserve as the sun had now come out. We found a small clearing and had a picnic lunch there. The reserve was really quiet, we almost must have had it to ourselves. 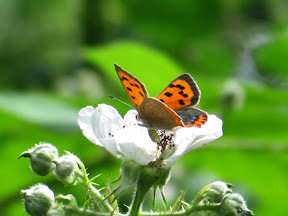 Apart from the loads of butterflys flitting about. Moving on again we returned to R's parents house where the River Deben (much smaller here than it was at Hemley) runs past the end of their garden. 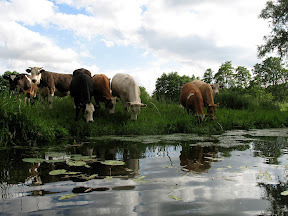 We paddled along in a boat, watched by cows in the meadows alongside. To cap the weekend off we went out for tea again, this time to The Seal pub in Woodbridge. Shame to be back in work today! I'd much rather have continued our 'holiday at home'. That's really interesting about the 'good year for poppies'! I love poppies, and have been really enjoying seeing them over the past weeks. Holidays at home can be some of the best. I was also out cycling on Sunday for the first time in ages. Mr Ruby is a keen cyclist, but I only got a bike recently and had used it once - on the ride home from Cycle King! But on Sun, out it came and we went along the Moreton Hall cycle path towards Thurston for quite a way. Only did 2 miles as the kids were with us on their bikes too. But we had a great time and will be out cycling again soon I reckon! Cycle King is where our bikes came from too. 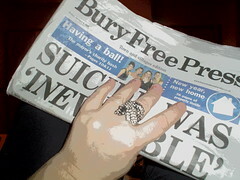 About 8 years ago I think it was, soon after we moved down to Suffolk after university. love this photo, I have heard occasionally cows get a bit too close and have been known to slip into some rivers and be rescued but that could be an old farmers tale. 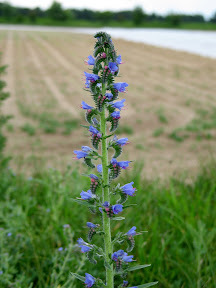 Your mystery plant looks like a viper's bugloss to me, but I'm no expert! Looks like a lovely cycle ride. Buryblue - I expect that cows may well sometimes get into the Deben. There was one patch of bank that looked quite trampled as though something large had been stuck there, but it didn't back straight on to a field. Catie - yes I'm sure it is a Viper's Bugloss too. I've looked it up at home and it does match.